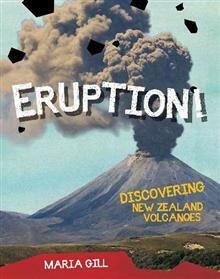 Meet Volcanica, the feisty reporter at Magmatic Press who presents hot facts about volcano science in New Zealand. Discover the four main types of volcano found in this country: stratovolcanoes, shield, caldera and volcanic fields and explore the characteristics of each as demonstrated in data panels and aerial photographs of selected volcanoes around New Zealand. Bright colourful graphics depict key aspects of volcanic activity such as fissures, fumaroles, debris avalanches, craters and fire fountains and kids are encouraged to find these again through the book. Special features devised by the author provide extra learning opportunities: Maoritopia has creation stories and Maori legends, Videotopia gives to access online educational videos and animations, and there's Factopia with flash facts for additional knowledge. Resources at the end of the book list trips to visit volcanoes, books to read and advice about what to do in the event of an eruption, along with a comprehensive index and a map locating the volcanoes described in the book.